I arrived at the iconic Crown Building on 5th Avenue to explore through Helen Yarmak’s newest Fur Sensation line for New York Fashion Week and was thrilled at how the event turned out. The elevator ticked ‘til it hit the 23rd floor, and I was ushered out and greeted by friendly faces. The penthouse showroom suite was set for glamorous people with luxurious lifestyles—much like the brand and designer herself. I moseyed around the showroom snapping photos of the fabulous mannequins (yes, the mannequins were styled great!) and then was surprised to see models strutting around the room theatrically—posing this way and that. The intimate setting was perfect to meet people, see each look up close, and to have one of the best rooftop views in the city. Beautiful! Helen drew her inspiration from sensational patterns and color which are brought to life through her designs. She chose to infuse checkerboard, stripes, and color-blocking on her new shapes and styles. Other furs used are mink, lamb, fox and ermine. Legendary style icon Patricia Field was the celebrity stylist at the event. She styled the models with such a luxurious edgy look down to the very last detail. 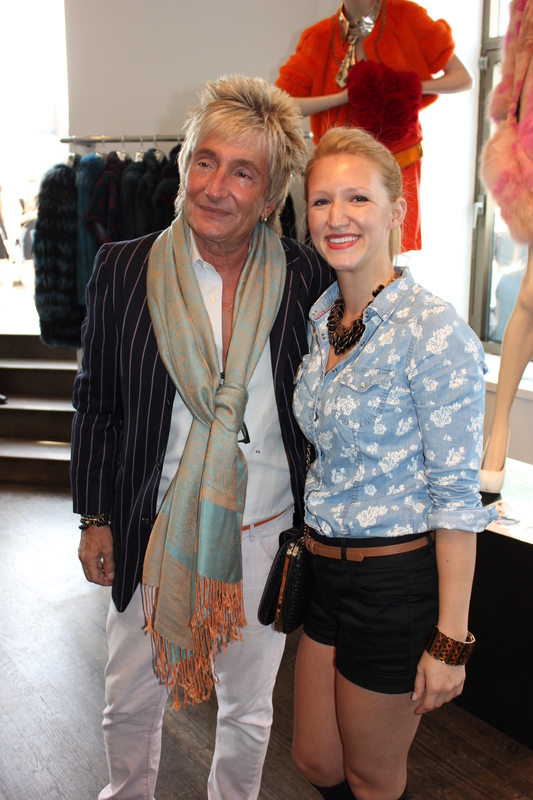 In addition to Patricia, Rod Stewart made an appearance. He hung out as we all checked out Helen Yarmak’s new designs. And yes—that’s me posing with him in the photo! See the photos above to see all of Helen Yarmak’s gorgeous line.